Live Serenity! A first class luxury high rise. Well appointed 2 bedroom/2bath, 835 sq. ft. condominium. 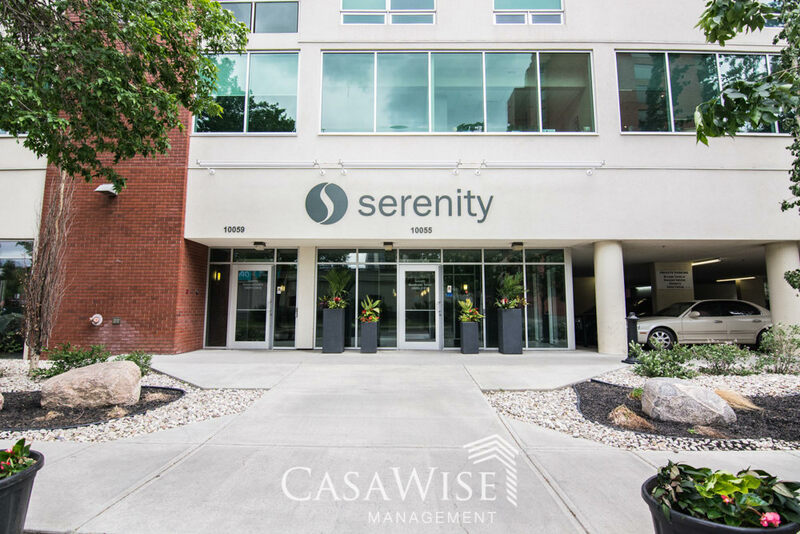 The unit features hardwood flooring, in-suite laundry, modern window coverings, and comes with a heated secure u/g parking stall. You will appreciate the kitchen package with upgraded appliances and granite countertops. Master bedroom has 3 piece ensuite with walk-in closet and bathrooms feature granite countertops with modern sinks. Balcony includes a gas barbeque hookup. The extensive river valley walking and biking trails are 1 block away; bus service at front of building and LRT only 8 blocks. Across the street is a grocery supermarket with plenty of restaurants, shopping and all amenities within walking distance. Easy access to central downtown; Grant MacEwan, NAIT; Royal Alexander Hospital. LRT (light rapid transit) providing access to University of Alberta. Please note: The photos shown in the ad are not of the actual unit. Some minor details vary.